EEK Spiders! Yuk! 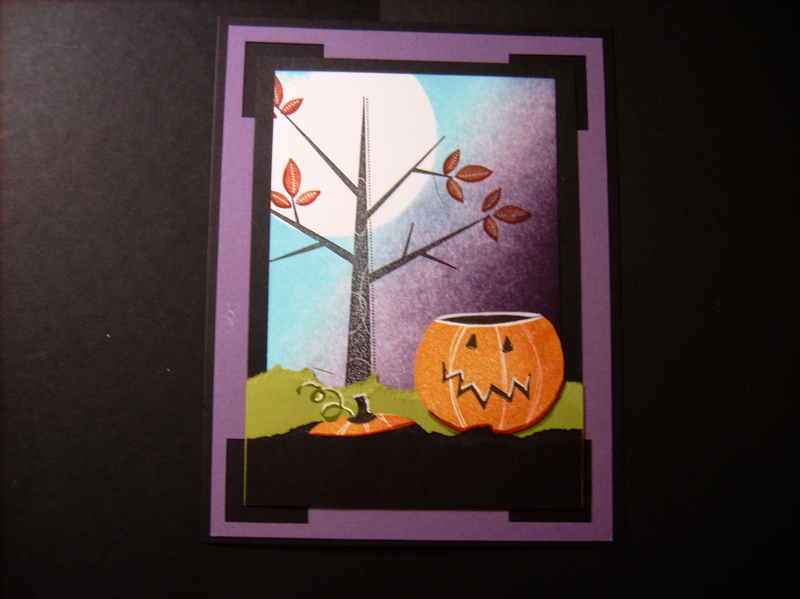 For my Perfectly preserved workshop, I wanted to include a Halloween card. The Stampin Up Holiday Catalog features bundles priced to save you 15% when purchasing the items as a bundle. The Perfectly Preserved bundle #131022 includes the Perfectly Preserved stampset #126692 and the coordinating Cannerey framelit set #127822. I am definately not domestic enough to can anything but I love this bundle. 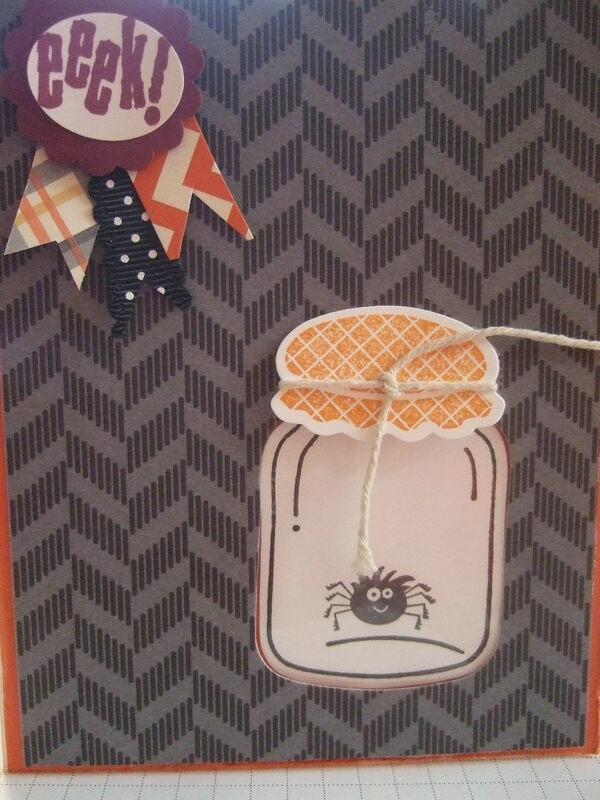 For this card, I used the Howlstooth and Scaringbone DSP #126906 used the jar die and cut through the chevron DSP and then placed the embossed jar underneath with a spider from the Spooky Bingo Bits#123946, then used a piece of transparency to give the jar a real look (and to keep the spider in ;)! I topped the jar with a cute lid stamped from the perfectly preserved stampset, although I wish I would have used fabric, and tied it with a piece of non -SU string. I hand cut pennant banners and eeked it out with the new 1 1/4 inch scalloped circle to create the “card candy”. Stay tuned to see how I used the Perfectly Preserved bundle in the traditional sense. It’s truly a “Wonderfall” time of year. In Ohio, the leaves have begun to turn, football Friday nights are in full swing- complete with the pride of Pickerington’s marching panthers and the weather is absolutely beautiful. 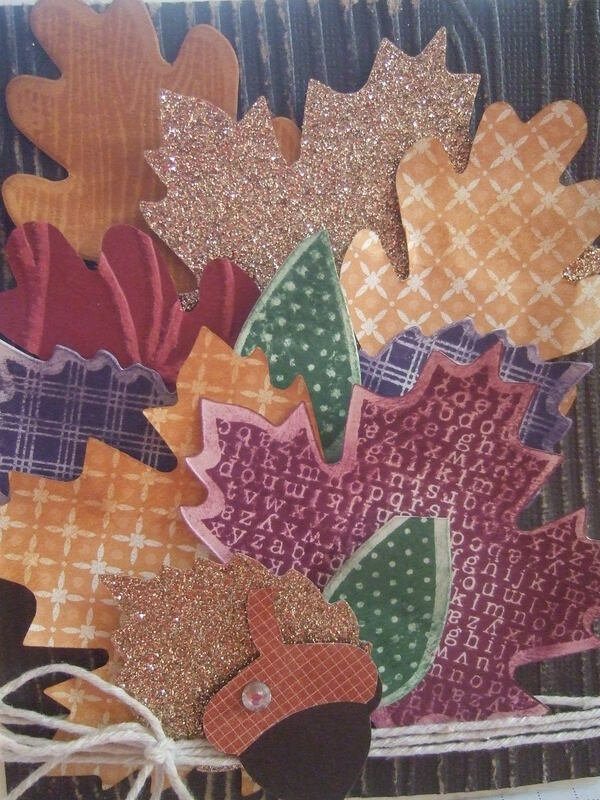 With that I decided to make a spectacular card to showcase the fall season and the Stampin Up Wonderfall stampset #128087 and coordinating leaf die #127812 from the Holiday Catalog. The picture does not do the card justice but the leaves cut from the Champagne Glimmer Paper #127885 and the cute little acorn bring this card to life. Sunflowers are my all time favorite flower. When I looked at the catalog image of the Floral Fusions Framelits #127012 on page 191 of the Stampin Up Annual Catalog, my mind instantly thought I want to make a shaped sunflower card for my upcoming card cafe. I used the largest framelit and cut a piece of folded 11 x5.5 inch daffodil paper and made the card base. I then cut a single layer using the 2nd largest framelit and textured it with the new woodgrain textured embossing folder #127821 and layered it on the card base. I then used the 3rd largest framelit in early espresso for the outer center piece and a piece of DSP from the International Bazaar DSP#126920. 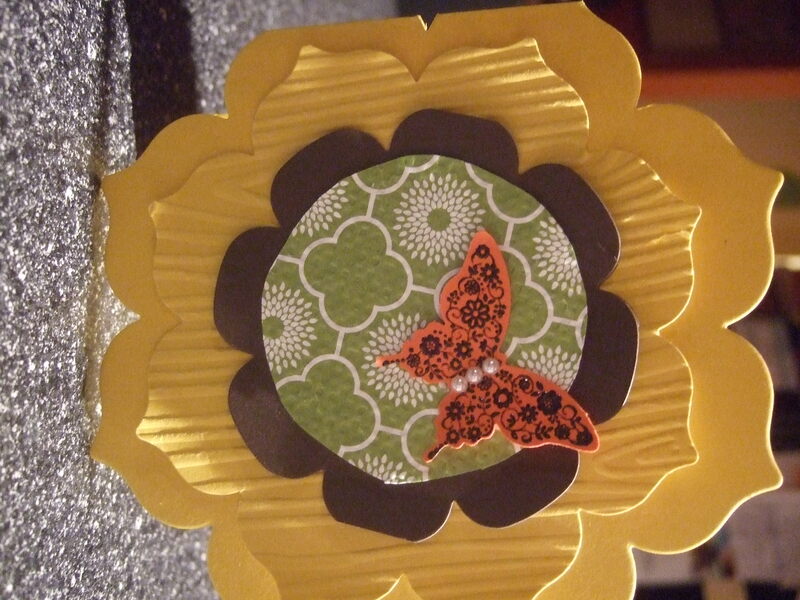 I used the Papillion Potpourri #123759 stampset and the coordinating Elegant Butterfly punch #127526 and adorned it with 3 pearls. 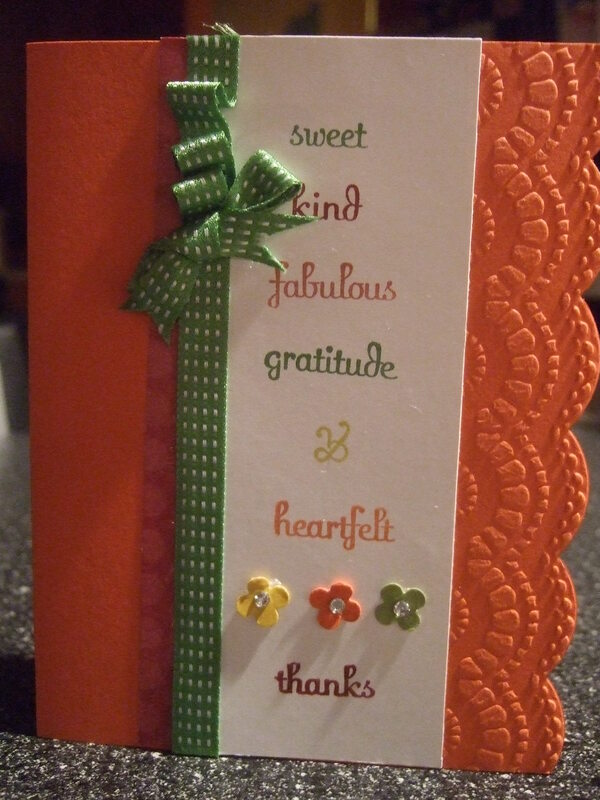 I make so many cards and it seems like I am never thrilled with the results but this card just truly makes me happy. Today’s card is a CASE (Copy and Share Everything) card using my favorite newly purchased Stampin Up stampset – Fabulous phrases#120501. The edge of this card is textured with the Delicate Design folder #127023 and then cut with the large scallop edgelit #127019.This stampset has been around for awhile and I was a hold out until a few weeks ago when I placed a demonstrator order. This card also features the gumball green 3/8″ satin stitched ribbon that was free with my $40 purchase now through September 30th. There is no limit to how many spools of this fabulous ribbon you can get but hurry up time is running out on this great deal. I wanted to showcase the Free Ribbon available in the Stampin Up Back to Spool special for just a few more days (thru Sept 30) with a qualifying order. For every $40 spent you can select a free spool of 3/8″ In color Satin Stitched ribbon. 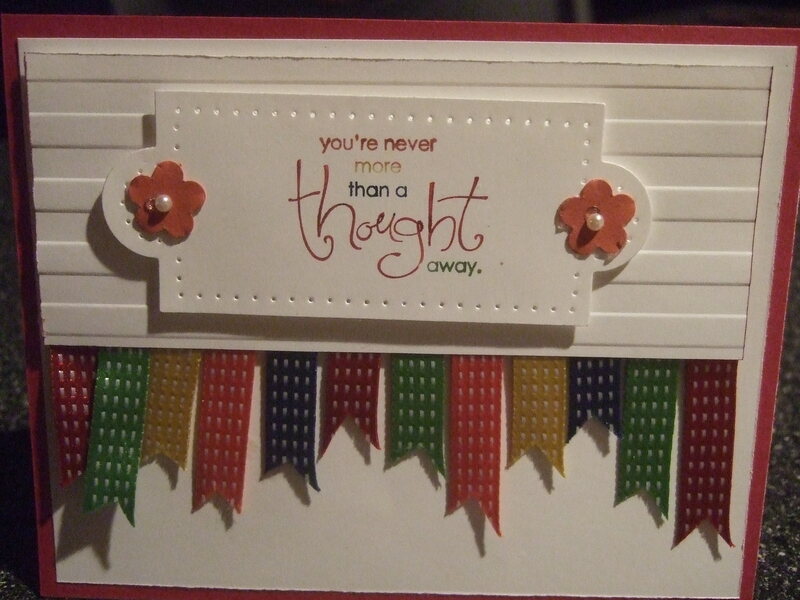 I love this ribbon and love the look of banners so I combined the 2 to make a super quick card. The sentiment is stamped on whisper white and then cut with the Apothecary Accents Framelits #127003 and then pierced with Essentials Paper Piecing Pack #126187 and the new paper piercing tool aa3126189 and Stampin Pierce Mat #126199. It’s the 25 th of the month and that means one thing- time to post a Christmas card. Today’s Christmas card is one that Cammie did for her Christmas card workshop. 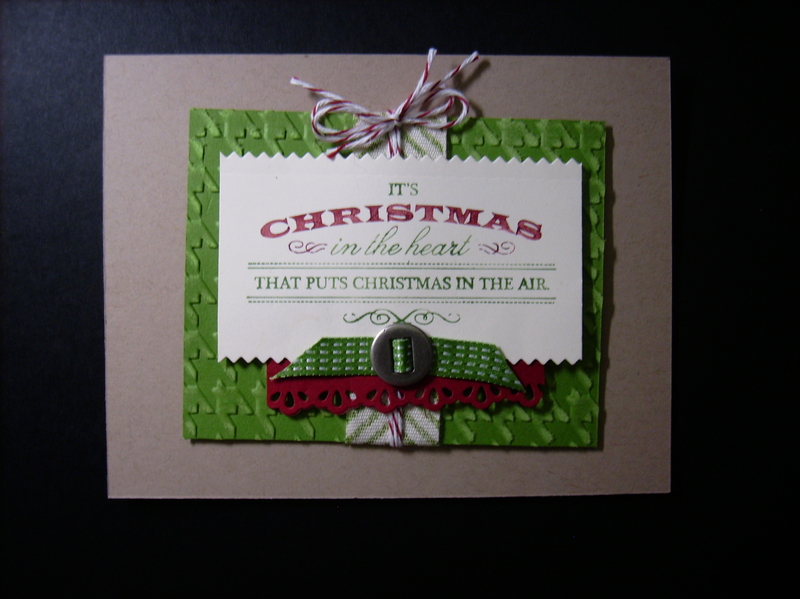 The card is a CASE (Copy and Share Everything) from a card featured on page 14 of the Stampin Up Holiday catalog. This card features the Heart of Christmas stamp #128129 and the 7/8 ” stampable cotton ribbon stamped with the chevron pattern from the Border Banter stamp set #128930. The satin stitched ribbon (free with qualifying order through 30 Sept) is threaded through the super cute Designer Ribbon Slides #127834. Today’s post is a wonderful card made by Yvonne Crook from Tulsa OK. Love everything about this card and the great brayer job Yvonne did to create the fall scene. Both Yvonne and Cammie took the brayer class from the “brayer queen”- Michelle Zindorf and with all the cards they have been turning out lately the class sure paid off. Guess it is time for me to put away the summer stuff, close the pool and bring out the pumpkins to get ready for fall.